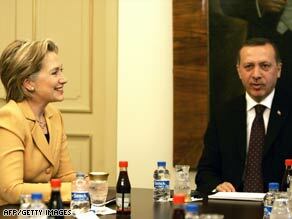 President Obama plans to visit Turkey in about a month, Secretary of State Hillary Clinton said Saturday. Clinton was holding talks in Ankara with officials “to emphasize the work the United States and Turkey must do together on behalf of peace, prosperity and progress,” she said. Obama had said he was going to deliver a speech in a Muslim capital within the first hundred days of his presidency. Clinton did not say that Obama would be making such a speech during this visit. The State Department on Saturday issued a joint statement from Clinton and Turkish Foreign Minister Ali Babacan reaffirming the close U.S.-Turkish relationship. Both countries pledged to pursue an Arab-Israeli peace settlement, peace in the southern Caucasus region, normalization of Turkish-Armenian relations and a settlement of the Cyprus question — a dispute between Greek and Turkish Cypriots over territory. They vowed to enhance the fight against terror groups such as al Qaeda and the Kurdistan Workers’ Party and work to expand the natural gas and oil infrastructure to help Caspian basin and Iraqi energy producers reach European and world markets. Turkey is a secular country and predominantly Muslim. It is a NATO member and has been a longtime ally of the United States. It is one of the few Muslim countries to have full diplomatic relations with Israel and has long been the Jewish state’s closest military and economic partner in the region. Turkey recently mediated indirect peace talks between Israel and Syria. U.S. envoys Jeffrey Feltman and Daniel Shapiro arrived Saturday in Syria and are meeting with Syrian Foreign Minister Walid Moallem, a Syrian government spokesman said Saturday. The meeting will explore Washington’s relationship with Damascus, Clinton said earlier this week. “There are a number of issues that we have between Syria and the United States, as well as the larger regional issues that Syria obviously poses,” she said.